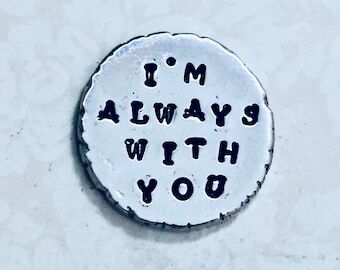 Announcement Dolphin Moon Creations specializes in Personalized Hand Stamped, Handcrafted, Gemstone Jewelry and Gifts - I pride myself on creating high quality affordable jewelry and have many different styles available. If you need a gift in a hurry you can also search my shop for "Ready to Ship" items that mail out within 1 business day. I have always tried to be "GREEN" reusing supplies, packaging etc. but now I'm going Greener! My Green Bubble Wrap can be "Recycled" as plastic for the first 12 to 18 months, or it will biodegrade in 18 to 24 months if discarded into a land fill. Be Green - Reduce, Reuse, Recycle - Help keep the planet clean! 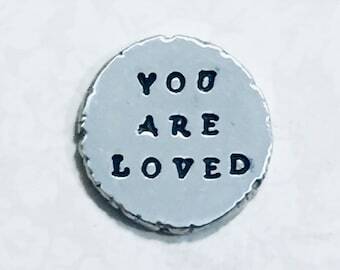 Not all hand stamped jewelry is created equal! Always check the gauge of the piece. I use a heavier 22 gauge on all of my sterling silver circle pieces. Occasionally some of my other styles may be a slightly thinner 24 gauge such as the teardrops. The lower the gauge the thicker the piece will be. Please feel free to ask the gauge before purchasing. All of my charms, findings and chains are .925 Sterling Silver unless otherwise specified. 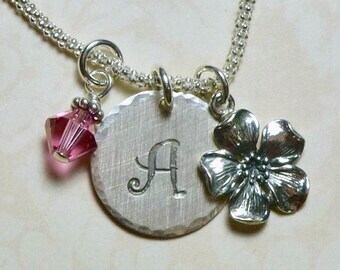 All of my sterling silver pieces that have darkened (antiqued) letters are oxidized by hand. I do not use a Sharpie marker! I also supply high quality Italian made .925 sterling silver chains. *Please note: Virginia residents will be charged 5.3% sales tax. PayPal payments will have the 5.3% sales tax added during checkout. Dolphin Moon Creations specializes in Personalized Hand Stamped, Handcrafted, Gemstone Jewelry and Gifts - I pride myself on creating high quality affordable jewelry and have many different styles available. Shipped fast and she worked with us to fit our daughters long name on the back of our coins. Very fast at responding to messages. 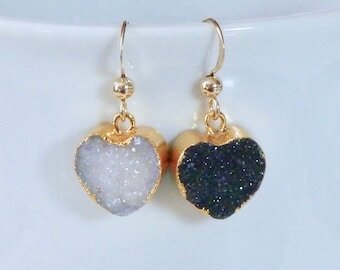 New earrings now available in my shop - More coming soon! 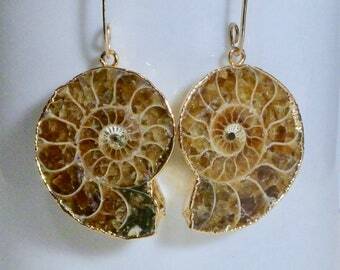 Ammonites, Solar Quartz on handcrafted Artisan Argentium Silver and Gold Filled Ear Wires. A Sampler of some of my February birthday gift ideas! 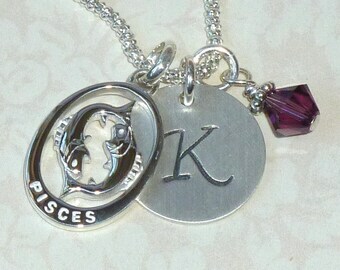 Pisces zodiac and amethyst birthstones. 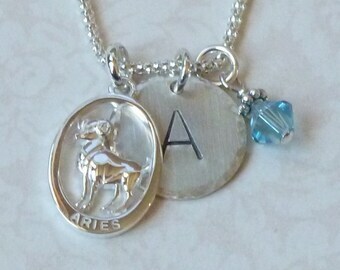 Five new Initial Charm Necklaces have been added to my shop! All Sterling Silver! Choose from a Horse Carousel, Dolphin, Elephant, Unicorn or Ferret. I started my Etsy shop in July 2008 and became an official "Quit my day job" entrepreneur in 2010. I run all aspects of my business from my studio. I love being creative and making all types of jewelry and crafts. My first love is hand stamping metal and beading but every so often you will see new items in my shop using different jewelry and craft making techniques. I have always tried to be "GREEN" reusing supplies, packaging etc. but now I'm going Greener! My Green Bubble Wrap can now be "Recycled" as plastic for the first 12 to 18 months, or it will biodegrade in 18 to 24 months if discarded into a land fill. Be Green - Reduce, Reuse, Recycle! Do you have a passion or favorite saying? 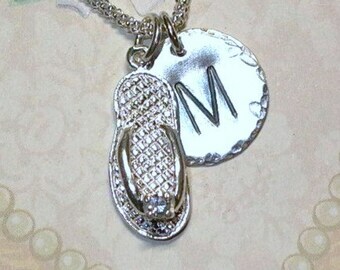 Let me hand stamp a custom made pendant or pair of earrings just for you or for you to give as a very special gift! 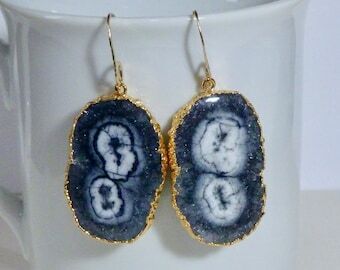 These make fantastic gifts for Mom, Grandmother, friend, teacher or anyone else you can think of! All of my creations are handmade and designed by me. My designs are made with the highest quality Sterling Silver, Cultured Freshwater Pearls, Swarovski Crystals, Natural Gemstones or Silver/Rhodium Plated Pewter (where noted). 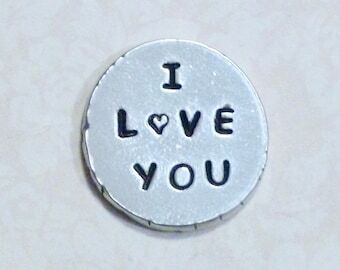 All pewter items are "Lead Free" and made here in the USA. 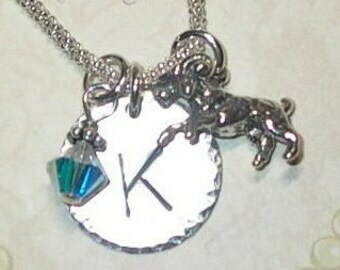 My custom creations make excellent gifts for that someone special on your list. 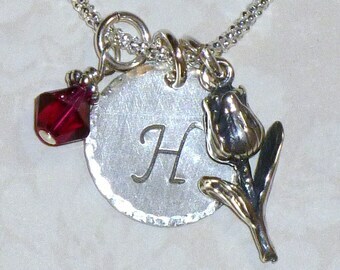 Honor a special person or occasion with a custom made piece of jewelry that will last a lifetime! Great for Sororities & Fraternities! February 2011 - Introducing my new line of personalized fabric covered button accessories including retractable badge reels, magnets, push pins, bookmarks, pony tail holders etc. Please check back - I will be adding new designs over the next few days. 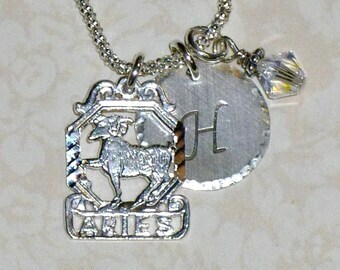 New for 2010 are my Initial Charm Dangle Bracelets. If you see a charm you like under the Necklaces - Just convo me for a listing. Most are now also available as a charm bracelet too! 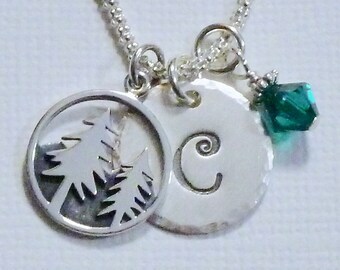 Introducing my new line of "Initial Charm Dangles" Hand Stamped Sterling Silver Necklaces. Something for Everyone here! Many different "Themes" available. 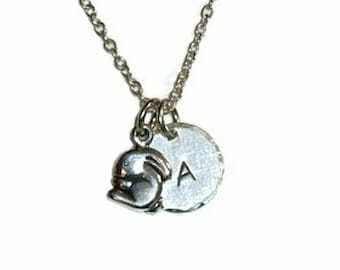 These necklaces will all include a single letter "Initial" of your choice, one swarovski crystal birthstone dangle and one sterling silver charm. If you do not see a specific charm that you are looking for please convo me I may be able to get it for you! Introducing my new section "Floral Garden". 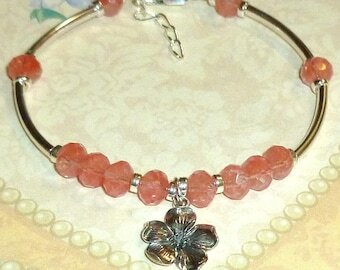 This new section will include all of my new Floral Czech glass designs. Please check back as I will be adding many new designs over the next few weeks. Check out my new section "Say it in Copper". This new section also includes all of my "Mixed Metal" designs which have both sterling silver and copper components. Please contact me if you have any questions. Most inquiries are answered promptly the same day. Please convo me if you have any problems with any of my items. I cannot accept returns on personalized items unless I made an error. If you request I can email you a picture of your item before I ship it. Non personalized items must be returned in un-used condition within 2 weeks or a re-stocking fee will apply. A refund will be given for the purchase price only not including shipping. The item must be wrapped in bubble wrap or tissue paper to protect the chain from crushing during return shipping. I take pride in my work and want your jewelry to "Last a Lifetime". Also please see my "Jewelry Care" section under additional information. Payments are accepted through Paypal or your credit card processed directly through Etsy. Please note: If you make your payment via paypal and choose payment from your checking account (E-Check) Your order will be held until paypal clears your check which usually takes 3-5 days. **Virginia residents will be charged 5.3% sales tax. PayPal payments will have the 5.3% sales tax added during checkout. **PLEASE NOTE: International customers are responsible for all Taxes, Custom and Duty Fee's before your item can be delivered. I will include a customs form completed with the items actual value. I ship via USPS First Class Mail which takes 2-5 days for shipping, or you may upgrade to USPS Priority Mail which takes 2-3 days depending on where you are located in the US. Priority Mail Delivery Service is not guaranteed to be delivered in the specified time. Shipping times DO NOT include my processing time which is typically 2-5 business days. Items are processed and shipped to you promptly, usually within 2 to 5 business days after receipt of cleared payment. Please note: It is extremely difficult to determine "In transit" time for Int'l packages. Please figure on a minimum of 4 weeks "In transit time" for the delivery of your order. All orders are shipped via International First Class Mail. **PLEASE NOTE: International customers are responsible for all Taxes, Custom and Duty Fee's. I will include a customs form completed with the items actual value. Please note that the products on this website are not designed for or intended to be used by children 12 years of age or younger. The Consumer Product Safety Improvement Act of 2008 (CPSIA)sets limits on the use of lead in products. Some of my products may contain traces of lead such as in swarovski crystals etc. You can request a cultured freshwater pearl dangle instead of a birthstone crystal. When you are not wearing your jewelry I recommend that you keep it in a tightly closed zip lock bag in a cool dry place. This will help to reduce the tarnishing process. Tarnishing is a natural process caused by oxidation. It does not damage the silver and it can be easily removed. Gently rub the piece with a soft treated silver polishing cloth, or clean with a very mild soap, warm water and then pat dry. If cleaned regularly it will keep tarnish from building up on the silver. DO NOT USE TARNISH REMOVING DIPS on pieces that have PEARLS or decorative oxidation (ex Bali Beads) Letter beads and Bali style beads have oxidation in the grooves to produce an antique look. Never wear your Sterling Silver Jewelry while bathing, swimming, doing dishes, cleaning with chemicals or anything else where it would come into contact with abrasive soaps or chemicals. I also recommend that you DO NOT "SLEEP" with your jewelry on. It may cause unnecessary stress on the components which in turn will cause breakage. *HINT - If you wear your sterling silver jewelry regularly your body's oils will help to reduce the effects of tarnishing. In order for me to fulfill your order, you must provide me with certain information (which you authorized Etsy to provide to me), such as your name, email address, postal address, and the details of the product that you’re ordering. You may also choose to provide me with additional personal information if you contact me directly. Service providers. I engage certain trusted third parties to perform functions and provide services to my shop, such as delivery companies (USPS). I will share your personal information with these third parties, but only to the extent necessary to perform these services. For purposes of EU data protection law, I, Lorraine Heinitz, am the data controller of your personal information. If you have any questions or concerns, you may contact me through Etsy conversations or contact me directly at dolphinmooncreations [!at] gmail.com.